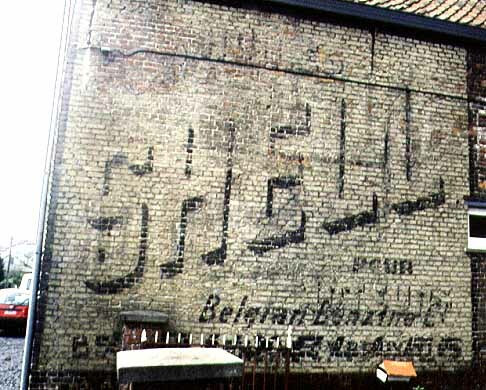 The type face suggests a younger wall. 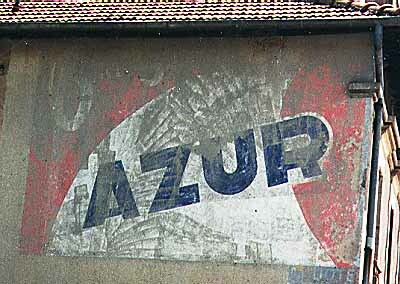 The star is gone and makes place for a more dynamic look evocating Azur on the road. 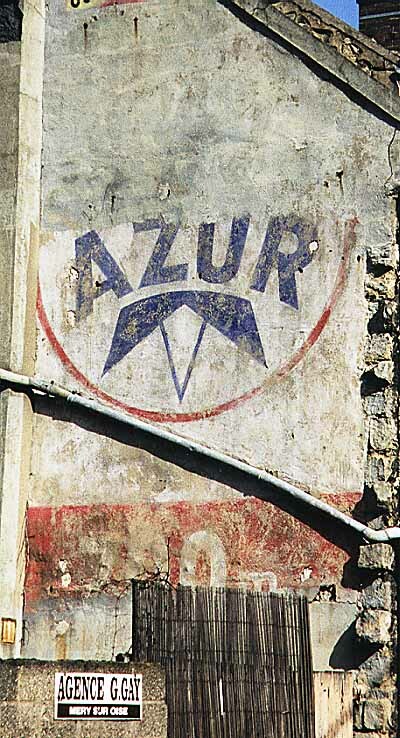 Azur uses the same colours as Total. Both are French companies and were proud to show it. 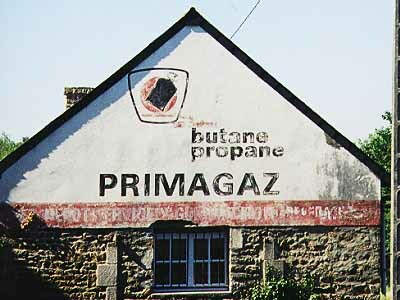 The brand ceased to exist before the 1970's. 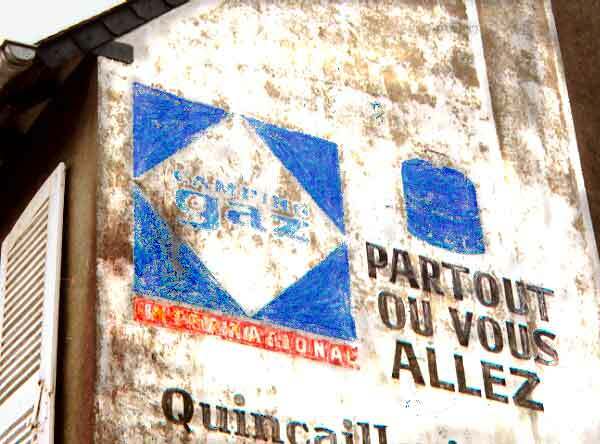 It was absorbed by Total's mother company some years earlier. 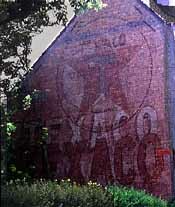 The emblem is the 1960s version. 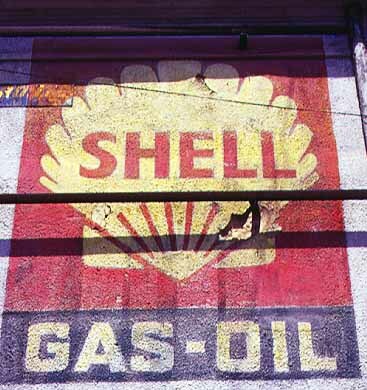 From 1971 onward the brand's name was placed below the pecten and in lowercase. 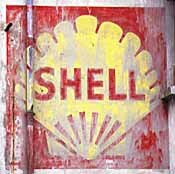 + The London "Shell" Transport and Trading Company, was founded in 1897 by Marcus and Sam Samuel and named after their father's trade: decorative sea shells (since 1833). 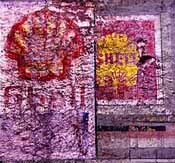 + The Dutch Royal Dutch Company for the Exploitation of Petroleum Wells in the Netherland's East Indies was incorporated in 1890 and would develop the oil wells discovered in Sumatra by Mr. Zijlker. 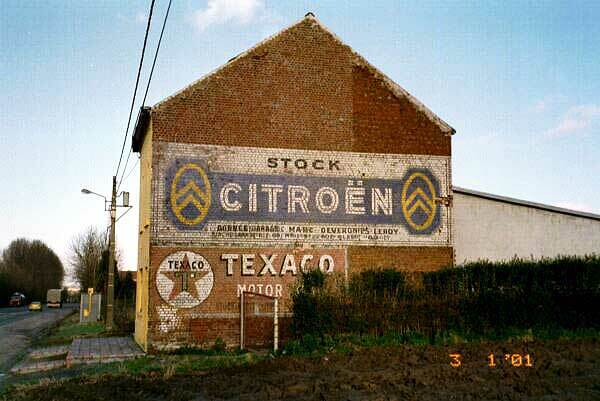 Both companies allied in 1907, but never merged. 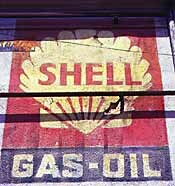 The company's website (www.shell.com) has an exemplary section about both partner's history. 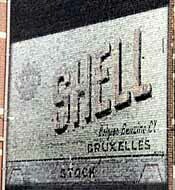 Find the special about the logo: 100 years of the Pecten. The Dutch site features the highlights in Dutch. 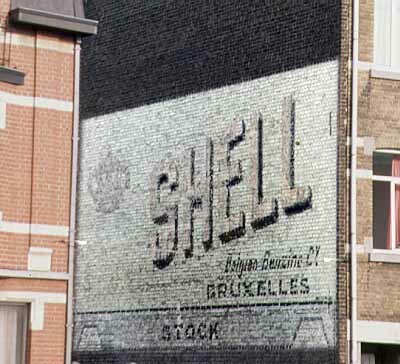 The Tondorf mural shows the famous logo of the SHELL Transport parent. 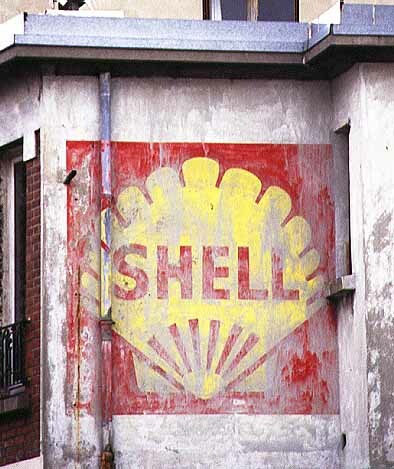 Royal Dutch's logo was a crown and was, according to Shell's website, abandoned shortly after the alliance took place. 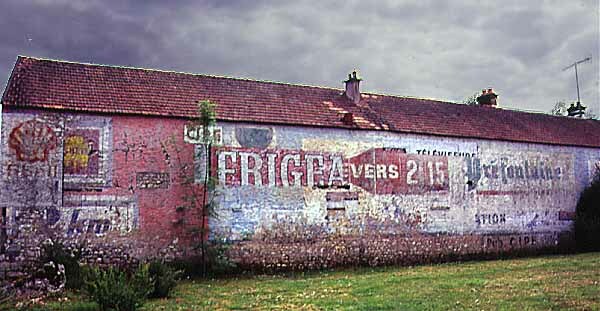 It is therefore all the more surprising that the Vilvoorde-wall carries a crown. Could this wall stem from the early 1910's? Difficult to believe. Belgium was probably a bit retarded in adapting to the new logos. Needs further research. More: neither of the Belgian finds shows the pecten. 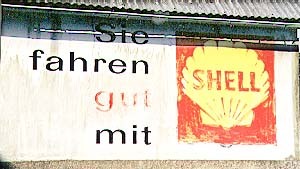 +left: the 1970s pecten with brand in lowercase below the logo. 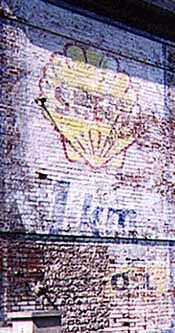 +right: the 1960s pecten with brand in uppercase inside the shell. 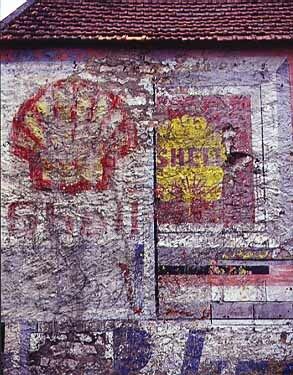 This ad is part of a complete wall with several brands unfortunately all in bad shape. 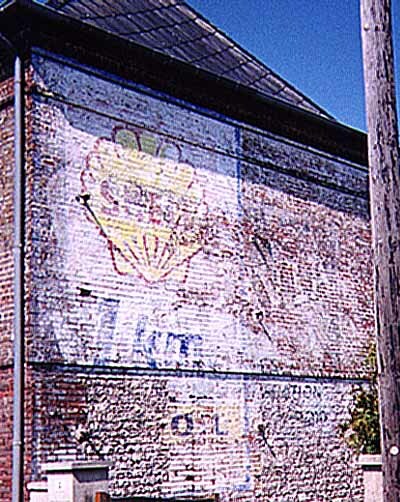 The Shell ad (left picture) hides an older Frigeavia mural. More about Frigeavia in the section with Home appliances. 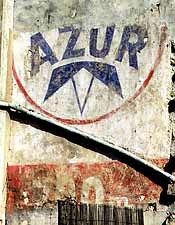 The brand was introduced on July 14th, 1954 and the colours were chosen with the French patriot in mind. 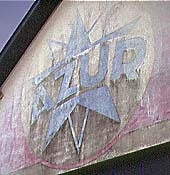 This mural shows the first generation of the logo. 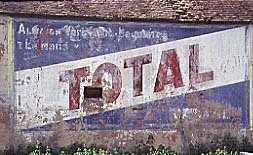 The company was born in 1924 as Compagnie Française des Pétroles and took the name of the main brand Total in 1991. 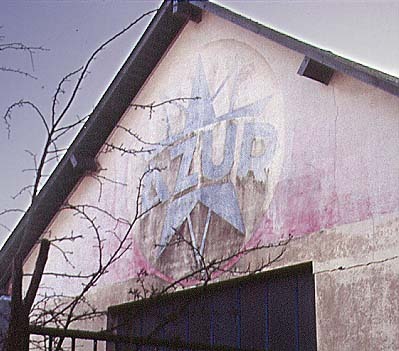 The TOTAL site with more about the evolution of the logo. Continue your reading on Texaco's website. Two layers with the same brand in different colours. The wall also says: Marque déposée. 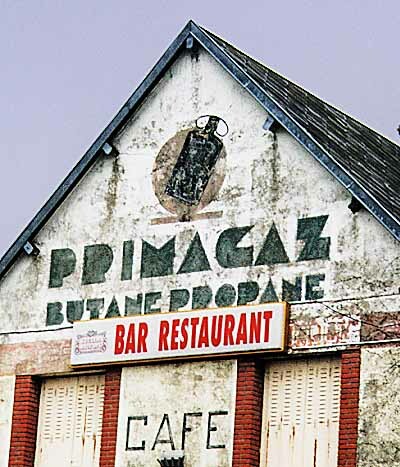 Visit the company's site for a short history in both French and English.